This range of Essense&Co. 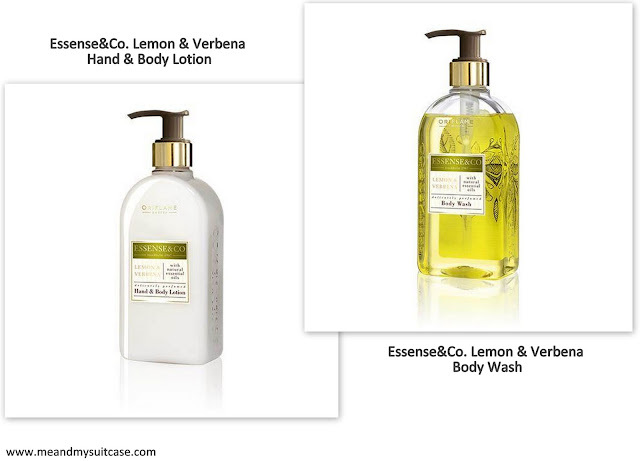 Lemon & Verbena by Oriflame has 3 products in its kitty viz. Body wash, Hand wash and Body & Hand Lotion. I have been using Body wash and Lotion for some time now and believe me it's just so amazing. Not only the fragrance even the feel of it so soft and refreshing. Hydrating body wash blended with natural essential oils. Gentle enough to use every day, this moisture-rich body wash produces a rich, creamy lather that leaves skin conditioned, satiny soft and beautifully scented with refreshing citrus notes of Lemon and Verbena. Dermatologically tested. Hydrating hand and body lotion blended with natural extracts and essential oils sumptuously pampers and delicately perfumes your skin with the lively scent of Lemon and Verbena. Easily absorbed, this luxurious, non-greasy lotion leaves skin feeling soft and supple. The perfect follow-up after using with the Lemon & Verbena Liquid Hand Soap or Body Wash. Dermatologically tested. The products leaves a tantalizing lemony fragrance on the body which remains for a long time and makes you feel fresh whole day. The packaging is lovely and has a no fuss body. Both the products are 300 ml bottles wherein body wash costs INR 699 and the lotion INR 799 and they are perfectly worth the money.